area models have generally been considered inappropriate for scaling small children to adults, and a non-linear relationship between weight and drug elimination capacity is now widely accepted. The consideration of accurate pharmacological and pharmacokinetic data for pediatric dosing may involve the use of cumbersome mathematical analysis in order to obtain a rational, safe, and effective dose. However, the log of basal metabolic rate plotted against the log of body weight in all species studied produces a straight line with a slope of 0.75, and the use of dosing equations has largely been replaced by adjustment (or normalization) of the drug dose for either body weight or body-surface area (Anderson and Holford 2008; Anderson and Meakin 2002). The pharmacokinetics and pharmacodynamics of analgesics change during development with profound changes over the first few months of life (Table 20.1). Most current age-specific dosing requirements are based on the known influence of ontogeny on the disposition of drugs. Developmental changes in physiology produce many of the age-associated changes in the absorption, distribution, metabolism, and excretion of drugs that culminate in altered pharmacokinetics and thus serve as the determinants of age-specific dose requirements (Berde and Sethna 2002). Age-related changes Larger extracellular and total body water spaces in neonates; Adipose stores with higher ratio of water to lipid. Decrease in quantity of total plasma proteins (albumin and a1-acid glycoprotein in neonate and young infant. Presence of fetal albumin and increase in bilirubin and free fatty acids. Relatively elevated intragastric pH (>4) and less gastric secretion in the neonate. Immature passive and active intestinal transport immature until age 4 months. Immature conjugation and transport of bile salts. Greater number of high-amplitude pulsatile rectal contractions. Delayed maturation of hepatic drug-metabolizing enzyme activity. Immature expression of phase I enzymes (cytochrome P450 isozymes) and phase II conjugation enzymes (e.g., glucuronosyltransferases) in neonates and infants. Reduced skeletal muscle blood flow and inefficient muscular contractions in the neonate. Higher density of skeletal muscle capillaries. Decreased glomerular filtration rate, renal blood flow, and tubular secretion in the neonate and young infant. compounds with extensive renal elimination and thus constitute a major determinant of the ageappropriate selection of a dose regimen in young children. 0.2–0.4 mg/kg/day (max 15 mg/day) 1–2 mg/kg/dose 15–20 mg/kg/day q12 h 50 mg BID (for children 10–25 kg, 100 mg BID for children >25 kg. Do not use for children under 12 years of age with possible viral illness due to potential for Reye syndrome. Available as rectal suppository. Aspirin-like compound that does not increase bleeding time. Most commonly used NSAID in the USA. Also available as 100 mg/5 mL suspension. Also available as 125 mg/5 mL suspension. GI and CNS side effects are common. 7.5 mg/ 5 mL suspension. or elevated liver function tests (LFTs) are relative contraindications for the use of NSAIDs (Rubenstein and Laine 2004). Bronchospastic NSAID-exacerbated respiratory disease (ERD) has been reported in children and adults, and NSAID ERD is a concern in one of three teenagers with severe asthma and coexisting nasal disease (Sturtevant 1999). Pseudoporphyria has been associated with the chronic use of NSAIDs in some children (Lang and Finlayson 1994). Maximum dose is 400 mg/day or 8 mg/kg/day. Available as extended-release tablet. May lower seizure threshold in patients susceptible. Rarely associated with serotonergic syndrome. Oral use only. Prescribed with APAP as tablet or elixir. Nausea/constipation very common. ~10% of people lack enzyme to make codeine to active morphine agent. Oral use only. Usually prescribed with APAP. Oral use only. Sustained-release tablet is available. Usually prescribed with APAP. “Gold Standard” for pain treatment. Available as sustained-release tablet (8–12, 24 h duration) and as liquid formulation (2–20 mg/mL). Inexpensive. May cause histamine release and vasodilation. Often used when morphine causes intolerable side effects. Less itching and nausea usually compared to morphine. Useful in patients with decreased renal clearance. Very effective for short painful procedural pain. Oral transmucosal dose is 10–15 mg/kg. May cause nausea/ vomiting (20–30%), bradycardia or chest wall rigidity-Rx with naloxone or muscle relaxants. Metabolite (normeperidine) may cause CNS excitation and seizures. Potential fatal interaction with MAO inhibitors. May cause tachycardia and is a negative inotrope. Not recommended for routine use. Available as liquid preparation. Long duration of action. See text for dosing when pt is on chronic opioid use (varies [4–20X] due to incomplete cross tolerance). May prolong QT interval and some advocate ECG prior to starting therapy and regularly while on therapy. control the mu-receptor and the melanocortin-1 receptor, as well as genes that regulate the agents of opioid metabolism (e.g., the cytochrome P450 2D6 isozyme) are likely to account for some of this variability (Pasternak 2001; Pasternak 2005). It is important to obtain a pain medication history to elicit information on the efficacy and adverse effects of opioids used previously. Some patients will respond better to one opioid than another, even when the two opioids are from the same class; therefore, serial trials of opioids should be used to determine the most effective agent for the patient who is experiencing partial pain relief or significant adverse effects. Providers should administer opioid agents at regular intervals according to the predicted pharmacokinetics of the drug with “rescue” dosing for breakthrough pain. The typical “rescue” dose is 5–10% of the daily requirement of the opioid which can be given as frequently as every one hour for unrelieved pain. Escalation of dosing with incorporation of the breakthrough doses is encouraged to titrate to effect or side effects. Key concepts for the use of opioids for pain management include titration to effect, a goal for steady state analgesia, anticipation and treatment of side effects, and use of equianalgesic doses when switching opioids in patients who are opioid-naïve. Codeine, hydroxycodone, and oxycodone are commonly used oral opioids to treat pain in children. The sustained-released formulations of oxycodone, hydromorphone, and morphine, as well as methadone, are more commonly used to treat chronic pain in children. Often, codeine, hydrocodone, and oxycodone are administered in combination with acetaminophen (Tylenol® with Codeine #1-#4, Tylenol® with codeine elixir, Vicodin®, Lortab®, Percocet®, and Tylox®). These agents will have similar efficacy (analgesia, cough suppression) and adverse effects (sedation, nausea, vomiting, constipation, respiratory depression) when given at equipotent dosing. Codeine, hydroxycodone, and oxycodone have an oral bioavailability of approximately 60%, and achieve analgesic efficacy within 20 min after oral dosing. The elimination half-life of these agents is 2.5–4 h so they are often prescribed every 4–6 h for pain control. Codeine has a variable bioavailability (15–80%) but also is an inactive prodrug that has analgesic efficacy only via metabolism to morphine. This metabolism is dependent on the mixed function oxidases with the cytochrome P450 2D6 enzyme isomer. There are slow metabolizers of codeine (Caucasian 10%, Chinese 30%), and the drug is ineffective for these patients while 5% of the population will be ultra-rapid metabolizers with increased concentrations of morphine (Williams et al. 2001). Typically, codeine is prescribed at a dose between 0.5 and 1 mg/kg/dose. Tylenol with codeine elixir contains 120 mg of acetaminophen and 12 mg of codeine in each 5 ml (1 tsp). Tylenol #1-#4 tablets contain acetaminophen with varying amounts of codeine per tablet: Tylenol #1 (7.5 mg), #2 (15 mg), #3 (30 mg), #4 (60 mg). The acetaminophen (APAP) will potentiate the analgesia and allows, through the opioid-sparing effects, a lower dose of opioid. However, these agents, if used beyond the recommended dose, may lead to acetaminophen toxicity, and the FDA is considering the removal of all combination APAP/opioid drugs from the US market to avoid this potential hazard. Hydrocodone is prescribed at a dose of 0.1–0.2 mg/kg/dose and is available as an elixir or tablet combined with acetaminophen. Each 5 ml of the elixir contains 2.5 mg of hydrocodone and 167 mg of APAP. Tablets are available which contain between 2.5 and 10 mg of hydrocodone and 500–650 mg of APAP. Oxycodone is a semisynthetic opioid with mu and kappa-receptor activity which is also prescribed at a dose between 0.1–0.2 mg/kg/dose and is most commonly available as a tablet combined with acetaminophen; Percocet® contains APAP 325 mg with 5 mg oxycodone, and Tylox® contains APA P 500 mg with 5 mg oxycodone. Oxycodone is available as an elixir (without acetaminophen) with a concentration of 1 mg/ml or 20 mg/ml. Oxycodone is also available with acetaminophen as a sustainedreleased tablet (OxyContin®) for use with patients with chronic pain. This sustained-release formulation allows for BID or TID dosing and should only be used for opioid-tolerant patients. If the tablet is crushed or chewed, large doses of the agent can be released resulting in potentially serious respiratory or cardiovascular injury. been used in doses as high as 10 mg/kg daily to treat diabetic neuropathy as well as pain associated with peripheral nerve injuries. There is no pharmacokinetic or pharmacologic difference in the absorption or metabolism of mexiletine between adults and children. This agent is associated with frequent side effects which limit its ­utility as an analgesic for chronic pain; these adverse effects include nausea/vomiting, sedation, confusion, difficulty concentrating, diplopia, and ataxia. More commonly, the 5% transdermal lidocaine patch is used for neuropathic pain. The topical lidocaine 5% patch (Lidoderm®) is FDAapproved for the treatment of PHN and is associated with a reduction in pain in a variety of neuropathic pain syndromes in adults, including painful peripheral diabetic neuropathy, CRPS, post-mastectomy pain, and HIV-associated ­neuropathy. It is applied for 12 h/day with a maximum use of three patches at one time in the adult patient. The patch may be cut to size without loss of agent and used over multiple areas topically. There are minimal systemic effects and plasma concentrations (1/10 for cardiac effects and 1/32 for toxicity). In a study of five adolescents with chronic neuropathic pain, the use of 5% lidocaine patches were associated with improved analgesia in 80% of patients (Nayak and Cunliffe 2008). Other Adjuvant Agents Corticosteroids (e.g., dexamethasone or prednisone) are effective for the treatment of inflammatory neuropathic pain associated with peripheral nerve injury, pain associated with bone metastasis, pain associated with bowel obstruction, and headache pain associated with increased intracranial pressure (Shih and Jackson 2007). The analgesic effect of corticosteroids has been described for a broad range of doses. Indication for the use of corticosteroids is usually rapidly escalating pain with significant functional impairment. Common adverse effects of corticosteroids when used chronically or at high doses include weight gain, edema, dyspepsia, osteoporosis, Cushing’s syndrome, psychosis, and rarely GI bleeding (Knotkova and Pappagallo 2007). Bisphosphonate therapy is useful for pain related to bone metastases and has been used for the treatment of pain due to complex regional pain syndrome (CRPS) (Cortet et al. 1997; Varenna et al. 2000). In a study by Simm et al., bisphosphonates were used to treat five patients with chronic recurrent multifocal osteomyelitis with an 80% response rate (Simm et al. 2008). Pamidronate was used to treat intractable, chronic neuropathic pain in two adolescents with no evidence of improvement in pain or function (Brown et al. 2005). Thus, there are a few conflicting reports concerning the potential efficacy of bisphosphonates for children with chronic pain. Adverse effects from use of bisphosphonates include electrolyte abnormalities, GI symptoms (dyspepsia, reflux, nausea, and abdominal pain), and osteonecrosis of the jaw. Cannabinoids have been shown to have analgesic properties in animal models and clinical observations. The mechanism of action for analgesia is via a peripheral anti-inflammatory action (Knotkova and Pappagallo 2007). Cannabinoids have been reported to be helpful in the management of neuropathic pain associated with multiple sclerosis (Rog et al. 2005). Good evidence for the efficacy of cannabinoids is lacking; however, there is a report of the effective use of the synthetic cannabinoid CT-3 (1¢,1¢-dimethylheptylD8-tetrahydrocannabinol-11-oic acid) for the treatment of chronic neuropathic pain (Karst et al. 2003). In a case report by Rudich et al., dronabinol (Marinol®) was reported to be effective in the treatment of chronic intractable neuropathic pain in two adolescents (Rudich et al. 2003). Adverse effects include cognitive impairment, psychosis, and sedation. but also use for illness or conditions not included in labeling, and use via routes of administration not included in the product label (e.g., nasal ­fentanyl or midazolam, and clonidine for regional nerve blockade). A recent review of the literature suggests that the pharmacokinetics and pharmacodynamics of medications in neonates and children may not be well predicted by adult values, and that children may likely require significant adjustments in dose or interval for optimal efficacy and to minimize side effects. The United States Congress has enacted several laws intended to directly promote drug development for children, and these measures have increased the amount of information on the safe and efficacious use of drugs for children. The Food and Drug Administration Modernization Act (FDAMA) was passed in 1997 (Food And Drug Administration 1997), and offered pharmaceutical companies a 6-month period of marketing exclusivity if they performed studies in pediatric patients in response to a written request issued by the FDA. Marketing exclusivity incentives were attached to a period of existing patent protection or exclusivity and have been effective in prompting industry to conduct needed pediatric trials for drugs with existing patent protection or exclusivity. However, this program did not provide any incentivization for the study of off-patent, mostly generic, drugs due to the costs and risks of performing pediatric medication trials. Often by the time a pediatric trial has been conceived or performed, the drug is nearing its patent expiration and the trials cannot be completed in time to provide an adequate return on investment for the sponsor. With the common practice of off-label use and the paucity of available data concerning pediatric patients, the US Congress passed the Best Pharmaceuticals for Children Act (BPCA) in 2002. This legislation empowered the US Food and Drug Administration (FDA) and the National Institutes of Health (NIH) to fund studies of generic pharmaceuticals in children in which the sponsors would not support the study because of costs, risks, and lack of economic incentives. The Pediatric Research Equity Act (PREA) in 2003 codified the authority of the FDA to require pediatric studies of certain drugs and biologic agents (108th Congress 2009). With the passage of these three laws, there has been a greater emphasis on the study of medications in the pediatric population in order to determine effectiveness and safety of therapeutic agents. Trials of pharmaceuticals with potential use for children have recently begun to evaluate agents in common use. c­ apabilities and resources of the institution. Financially, the initial costs of adoption and ­ongoing costs of maintenance of CPOE may be prohibitive to institutions in a competitive market (Lehmann and Kim 2006). The implementation of CPOE/CDS will directly connect: • Prescribers to data (patient records, drugs, and laboratory or radiology test results) • Prescribers to other health professionals (nurses and pharmacists) • Information systems to one another (patient records, drug and laboratory databases) • Departments to one another (patient care units, physician offices, pharmacies) On a technical level, CPOE and CDS reduce variation and provide decision support by: • Improving legibility • Reducing transcription errors • Using standard names, catalogues, and dictionaries • Linking patient-specific data and information • Providing evidence-based order sets • Automating calculations • Providing alerts and reminders • Monitoring for adherence to best practice • Screening populations at risk There is an assumption that a decrease in medication error rates alone is sufficient to determine the efficacy of CPOE; this endpoint does not necessarily imply improved patient outcomes and safety. In a study by King et al., the introduction of CPOE into the hospital resulted in a 40% decrease in medication error rates; however, there was no evidence to demonstrate any effect from CPOE on actual or potential patient harm (King et al. 2003). Han et al. reported an increase in the mortality rate in a pediatric ICU (from 2.8 to 6.6%) after the introduction of CPOE, likely due to delays in medication administration and less nursing time at the patient’s bedside (Han et al. 2005). In a study by Del Beccaro et al., there was no effect on mortality rates in the PICU with the introduction of CPOE (Del Beccaro et al. 2006). Clearly, there are complexities with an examination of the effects or process on patient outcomes; however, research is needed to discern the actual impact of CPOE on patient outcomes. Summary Chronic pain in children may be nociceptive, neuropathic, or a mixed pain etiology. The treatment of pain and suffering of children should be an important element of care. Knowledge of the developmental issues related to pharmacokinetics and pharmacodynamics will guide the clinician to a rational approach to pharmacological pain management. A thorough understanding of the mechanism of action of the pharmacologic agents will provide a safe and effective use of drugs for the treatment of chronic pain. More research is needed to determine the appropriate dosing of agents and likely efficacy for children, and the FDA is encouraging more studies in the pediatric population. The use of CPOE and clinical decision support analysis will hopefully lead to a safer system to provide analgesics to children. References 108th Congress (2009). Pediatric Research Equity Act of 2003. S 650. Ref Type: Bill/Resolution. Amitai, Y., & Frischer, H. (2006). Excess fatality from desipramine in children and adolescents. Journal of the American Academy of Child and Adolescent Psychiatry, 45, 54–60. Anderson, B. J. (2008). Paracetamol (Acetaminophen): Mechanisms of action. Paediatric Anaesthesia, 18, 915–921. Anderson, B. J., & Holford, N. H. (2008). Mechanismbased concepts of size and maturity in pharmacokinetics. Annual Review of Pharmacology and Toxicology, 48, 303–332. Anderson, B. J., & Meakin, G. H. (2002). Scaling for size: Some implications for paediatric anaesthesia dosing. Paediatric Anaesthesia, 12, 205–219. Andrews, C. M., Krantz, M. J., Wedam, E. F., Marcuson, M. J., Capacchione, J. F., & Haigney, M. C. (2009). Methadone-induced mortality in the treatment of chronic pain: Role of QT prolongation. Cardiology Journal, 16, 210–217. Ash, J. S., Gorman, P. N., Seshadri, V., & Hersh, W. R. (2004). Computerized physician order entry in U.S. hospitals: Results of a 2002 survey. Journal of the American Medical Informatics Association, 11, 95–99. Barrett, D. A., Barker, D. P., Rutter, N., Pawula, M., & Shaw, P. N. (1996). Morphine, morphine-6-glucuronide and morphine-3-glucuronide pharmacokinetics in newborn infants receiving diamorphine infusions. 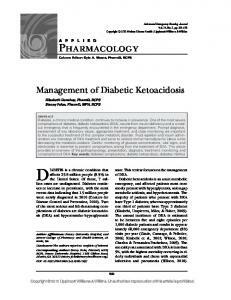 British Journal of Clinical Pharmacology, 41, 531–537. B.H. Lee Bates, D. W., Boyle, D. L., Vander Vliet, M. B., Schneider, J., & Leape, L. (1995a). Relationship between medication errors and adverse drug events. Journal of General Internal Medicine, 10, 199–205. Bates, D. W., Cullen, D. J., Laird, N., Petersen, L. A., Small, S. D., Servi, D., et al. (1995b). Incidence of adverse drug events and potential adverse drug events. Implications for prevention. ADE Prevention Study Group. Journal of the American Medical Association, 274, 29–34. Bates, D. W., Leape, L. L., Cullen, D. J., Laird, N., Petersen, L. A., Teich, J. M., et al. (1998). Effect of computerized physician order entry and a team intervention on prevention of serious medication errors. Journal of the American Medical Association, 280, 1311–1316. Bates, D. W., Teich, J. M., Lee, J., Seger, D., Kuperman, G. J., Ma’Luf, N., et al. (1999). The impact of computerized physician order entry on medication error prevention. Journal of the American Medical Informatics Association, 6, 313–321. Berde, C. B., & Sethna, N. F. (2002). Analgesics for the treatment of pain in children. The New England Journal of Medicine, 347, 1094–1103. Best Pharmaceuticals for Children Act (2002). 115 Stat 1408 (2002). 107–109. Ref Type: Bill/Resolution. Birmingham, P. K., Tobin, M. J., Henthorn, T. K., Fisher, D. M., Berkelhamer, M. C., Smith, F. A., et al. (1997). Twenty-four-hour pharmacokinetics of rectal acetaminophen in children: An old drug with new recommendations. Anesthesiology, 87, 244–252. Bizovi, K. E., Beckley, B. E., McDade, M. C., Adams, A. L., Lowe, R. A., Zechnich, A. D., et al. (2002). The effect of computer-assisted prescription writing on emergency department prescription errors. Academic Emergency Medicine, 9, 1168–1175. Blanco, J. G., Harrison, P. L., Evans, W. E., & Relling, M. V. (2000). Human cytochrome P450 maximal activities in pediatric versus adult liver. Drug Metabolism and Disposition, 28, 379–382. Bozkurt, P. (2005). Use of tramadol in children. Paediatric Anaesthesia, 15, 1041–1047. Brown, S. C., Jeavons, M., & Stinson, J. (2005). Effectiveness of pamidronate for treating intractable chronic neuropathic pain: Case report of two adolescents. The Clinical Journal of Pain, 21, 549–552. Butkovic, D., Toljan, S., & Mihovilovic-Novak, B. (2006). Experience with gabapentin for neuropathic pain in adolescents: Report of five cases. Paediatric Anaesthesia, 16, 325–329. Byas-Smith, M. G., Max, M. B., Muir, J., & Kingman, A. (1995). Transdermal clonidine compared to placebo in painful diabetic neuropathy using a two-stage ‘enriched enrollment’ design. Pain, 60, 267–274. Carrazana, E., & Mikoshiba, I. (2003). Rationale and evidence for the use of oxcarbazepine in neuropathic pain. Journal of Pain and Symptom Management, 25, S31–S35. Chamberlain, J. M., Slonim, A., & Joseph, J. G. (2004). Reducing errors and promoting safety in pediatric emergency care. Ambulatory Pediatrics, 4, 55–63. 20 Pharmacology of Chronic Pain Management Chez, M. G., Burton, Q., Dowling, T., Chang, M., Khanna, P., & Kramer, C. (2007). Memantine as adjunctive therapy in children diagnosed with autistic spectrum disorders: an observation of initial clinical response and maintenance tolerability. Journal of Child Neurology, 22, 574–579. Cortet, B., Flipo, R. M., Coquerelle, P., Duquesnoy, B., & Delcambre, B. (1997). Treatment of severe, recalcitrant reflex sympathetic dystrophy: assessment of efficacy and safety of the second generation bisphosphonate pamidronate. Clinical Rheumatology, 16, 51–56. Cron, R. Q., Sharma, S., & Sherry, D. D. (1999). Current treatment by United States and Canadian pediatric rheumatologists. The Journal of Rheumatology, 26, 2036–2038. Crowley, E., Willaims, R., & Couisns, D. (2001). Medication errors in children: a descriptive summary of medication error reports submitted to the United States Pharmacopia. Current Therapeutic Research, 26, 627–640. Dawson, G. S., Seidman, P., & Ramadan, H. H. (2001). Improved postoperative pain control in pediatric adenotonsillectomy with dextromethorphan. The Laryngoscope, 111, 1223–1226. Dayioglu, M., Tuncer, S., & Reisli, R. (2008). Gabapentin for neurophatic pain in children: A case report. Agri, 20, 37–40. De Witte, J. L., Schoenmaekers, B., Sessler, D. I., & Deloof, T. (2001). The analgesic efficacy of tramadol is impaired by concurrent administration of ondansetron. Anesthesia and Analgesia, 92, 1319–1321. Del Beccaro, M. A., Jeffries, H. E., Eisenberg, M. A., & Harry, E. D. (2006). Computerized provider order entry implementation: No association with increased mortality rates in an intensive care unit. Pediatrics, 118, 290–295. Dworkin, R. H., O’Connor, A. B., Backonja, M., Farrar, J. T., Finnerup, N. B., Jensen, T. S., et al. (2007). Pharmacologic management of neuropathic pain: Evidence-based recommendations. Pain, 132, 237–251. Ebert, B., Thorkildsen, C., Andersen, S., Christrup, L. L., & Hjeds, H. (1998). Opioid analgesics as noncompetitive N-methyl-D-aspartate (NMDA) antagonists. Biochemical Pharmacology, 56, 553–559. Ehret, G. B., Voide, C., Gex-Fabry, M., Chabert, J., Shah, D., Broers, B., et al. (2006). Drug-induced long QT syndrome in injection drug users receiving methadone: High frequency in hospitalized patients and risk factors. Archives of Internal Medicine, 166, 1280–1287. Ferrini, R. (2000). Parenteral lidocaine for severe intractable pain in six hospice patients continued at home. Journal of Palliative Medicine, 3, 193–200. Finkel, J. C., Finley, A., Greco, C., Weisman, S. J., & Zeltzer, L. (2005). Transdermal fentanyl in the management of children with chronic severe pain: results from an international study. Cancer, 104, 2847–2857. Finkel, J. C., Pestieau, S. R., & Quezado, Z. M. (2007). Ketamine as an adjuvant for treatment of cancer pain in children and adolescents. The Journal of Pain, 8, 515–521. 340 immediate-release liquid or sustained-release tablets for cancer pain. Jornal de Pediatria, 135, 47–55. Institute of Medicine. (1999). To err is human: Building a safer health system. Washington DC: National Academy Press. Institute of Medicine & Committee on Quality Health Care in America. (2000). To err is human: Building a safer health system (Report of the Institute of Medicine). Washington DC: National Academy Press. James, L. P., Capparelli, E. V., Simpson, P. M., Letzig, L., Roberts, D., Hinson, J. A., et al. (2008). Acetaminophenassociated hepatic injury: evaluation of acetaminophen protein adducts in children and adolescents with acetaminophen overdose. Clinical Pharmacology and Therapeutics, 84, 684–690. Johnson, K. B., & Davison, C. L. (2004). Information technology: Its importance to child safety. Ambulatory Pediatrics, 4, 64–72. Kanter, D. E., Turenne, W., & Slonim, A. D. (2004). Hospital-reported medical errors in premature neonates. Pediatric Critical Care Medicine, 5, 119–123. Karst, M., Salim, K., Burstein, S., Conrad, I., Hoy, L., & Schneider, U. (2003). Analgesic effect of the synthetic cannabinoid CT-3 on chronic neuropathic pain: A randomized controlled trial. Journal of the American Medical Association, 290, 1757–1762. Kastrup, J., Petersen, P., Dejgard, A., Angelo, H. R., & Hilsted, J. (1987). Intravenous lidocaine infusion–a new treatment of chronic painful diabetic neuropathy? Pain, 28, 69–75. Kearns, G. L., Bdel-Rahman, S. M., Alander, S. W., Blowey, D. L., Leeder, J. S., & Kauffman, R. E. (2003). Developmental pharmacology – drug disposition, action, and therapy in infants and children. The New England Journal of Medicine, 349, 1157–1167. Kelly, W. N. (2001). Potential risks and prevention, Part 4: Reports of significant adverse drug events. American Journal of Health-System Pharmacy, 58, 1406–1412. Kendrick, W. D., Woods, A. M., Daly, M. Y., Birch, R. F., & DiFazio, C. (1996). Naloxone versus nalbuphine infusion for prophylaxis of epidural morphine-induced pruritus. Anesthesia and Analgesia, 82, 641–647. Kimura, Y., & Walco, G. A. (2007). Treatment of chronic pain in pediatric rheumatic disease. Nature Clinical Practice. Rheumatology, 3, 210–218. King, W. J., Paice, N., Rangrej, J., Forestell, G. J., & Swartz, R. (2003). The effect of computerized physician order entry on medication errors and adverse drug events in pediatric inpatients. Pediatrics, 112, 506–509. Knotkova, H., & Pappagallo, M. (2007). Adjuvant analgesics. The Medical Clinics of North America, 91, 113–124. Kong, V. K. F., & Irwin, M. G. (2009). Adjuvant analgesics in neuropathic pain. European Journal of Anaesthesiology, 26, 96–100. Lacroix, D., Sonnier, M., Moncion, A., Cheron, G., & Cresteil, T. (1997). Expression of CYP3A in the human liver – evidence that the shift between CYP3A7 and CYP3A4 occurs immediately after birth. European Journal of Biochemistry, 247, 625–634. B.H. Lee Lalwani, K., Shoham, A., Koh, J. L., & McGraw, T. (2005). Use of oxcarbazepine to treat a pediatric patient with resistant complex regional pain syndrome. The Journal of Pain, 6, 704–706. Lang, B. A., & Finlayson, L. A. (1994). Naproxen-induced pseudoporphyria in patients with juvenile rheumatoid arthritis. Jornal de Pediatria, 124, 639–642. Lauder, G. R., & White, M. C. (2005). Neuropathic pain following multilevel surgery in children with cerebral palsy: A case series and review. Paediatric Anaesthesia, 15, 412–420. Leape, L. L., Lawthers, A. G., Brennan, T. A., & Johnson, W. G. (1993). Preventing medical injury. QRB. Quality Review Bulletin, 19, 144–149. Leape, L. L., Bates, D. W., Cullen, D. J., Cooper, J., Demonaco, H. J., Gallivan, T., et al. (1995). Systems analysis of adverse drug events. ADE Prevention Study Group. Journal of the American Medical Association, 274, 35–43. Leape, L. L., Cullen, D. J., Clapp, M. D., Burdick, E., Demonaco, H. J., Erickson, J. I., et al. (1999). Pharmacist participation on physician rounds and adverse drug events in the intensive care unit. Journal of the American Medical Association, 282, 267–270. Leapfrog Group (2009). Web page [On-line]. Available: http://www.leapfroggroup.org. Lee, B. H., Lehmann, C. U., Jackson, E. V., Kost-Byerly, S., Rothman, S., Kozlowski, L., et al. (2009). Assessing controlled substance prescribing errors in a pediatric teaching hospital: an analysis of the safety of analgesic prescription practice in the transition from the hospital to home. The Journal of Pain, 10, 160–166. Lehmann, C. U., & Kim, G. R. (2005). Prevention of medication errors. Clinics in Perinatology, 32, 107–123. vii. Lehmann, C. U., & Kim, G. R. (2006). Computerized provider order entry and patient safety. Pediatric Clinics of North America, 53, 1169–1184. Leppert, W., & Luczak, J. (2005). The role of tramadol in cancer pain treatment–a review. Supportive Care in Cancer, 13, 5–17. Lussier, D., Huskey, A. G., & Portenoy, R. K. (2004). Adjuvant analgesics in cancer pain management. The Oncologist, 9, 571–591. Malmberg, A. B., & Yaksh, T. L. (1992). Antinociceptive actions of spinal nonsteroidal anti-inflammatory agents on the formalin test in the rat. The Journal of Pharmacology and Experimental Therapeutics, 263, 136–146. Manfredi, P. L., Gonzales, G. R., Sady, R., Chandler, S., & Payne, R. (2003). Neuropathic pain in patients with cancer. Journal of Palliative Care, 19, 115–118. Marino, B. L., Reinhardt, K., Eichelberger, W. J., & Steingard, R. (2000). Prevalence of errors in a pediatric hospital medication system: Implications for error proofing. Outcomes Management for Nursing Practice, 4, 129–135. Massey, G. V., Pedigo, S., Dunn, N. L., Grossman, N. J., & Russell, E. C. (2002). Continuous lidocaine infusion for the relief of refractory malignant pain in a terminally ill pediatric cancer patient. Journal of Pediatric Hematology/Oncology, 24, 566–568. 341 pain. The American Journal of Hospice & Palliative Care, 26, 57–59. Rose, J. B., Cuy, R., Cohen, D. E., & Schreiner, M. S. (1999). Preoperative oral dextromethorphan does not reduce pain or analgesic consumption in children after adenotonsillectomy. Anesthesia and Analgesia, 88, 749–753. Rose, J. B., Finkel, J. C., Rquedas-Mohs, A., Himelstein, B. P., Schreiner, M., & Medve, R. A. (2003). Oral tramadol for the treatment of pain of 7 – 30 days’ duration in children. Anesthesia and Analgesia, 96, 78–81. table. Rowbotham, M. C., Goli, V., Kunz, N. R., & Lei, D. (2004). Venlafaxine extended release in the treatment of painful diabetic neuropathy: A double-blind, placebo-controlled study. Pain, 110, 697–706. Rowe, C., Koren, T., & Koren, G. (1998). Errors by paediatric residents in calculating drug doses. Archives of Disease in Childhood, 79, 56–58. Rubenstein, J. H., & Laine, L. (2004). Systematic review: The hepatotoxicity of non-steroidal anti-inflammatory drugs. Alimentary Pharmacology & Therapeutics, 20, 373–380. Rudich, Z., Stinson, J., Jeavons, M., & Brown, S. C. (2003). Treatment of chronic intractable neuropathic pain with dronabinol: Case report of two adolescents. Pain Research & Management, 8, 221–224. Saarto, T., & Wiffen, P. J. (2007). Antidepressants for neuropathic pain. Cochrane.Database.Syst.Rev., CD005454. Schley, M., Topfner, S., Wiech, K., Schaller, H. E., Konrad, C. J., Schmelz, M., et al. (2007). Continuous brachial plexus blockade in combination with the NMDA receptor antagonist memantine prevents phantom pain in acute traumatic upper limb amputees. European Journal of Pain, 11, 299–308. Schwartzman, R. J., Patel, M., Grothusen, J. R., & Alexander, G. M. (2009). Efficacy of 5-day continuous lidocaine infusion for the treatment of refractory complex regional pain syndrome. Pain Medicine, 10, 401–412. Scott, C. S., Riggs, K. W., Ling, E. W., Fitzgerald, C. E., Hill, M. L., Grunau, R. V., et al. (1999). Morphine pharmacokinetics and pain assessment in premature newborns. Jornal de Pediatria, 135, 423–429. Semenchuk, M. R., & Sherman, S. (2000). Effectiveness of tizanidine in neuropathic pain: An open-label study. The Journal of Pain, 1, 285–292. Sharma, S., Rajagopal, M. R., Palat, G., Singh, C., Haji, A. G., & Jain, D. (2009). A phase II pilot study to evaluate use of intravenous lidocaine for opioid-refractory pain in cancer patients. Journal of Pain and Symptom Management, 37, 85–93. Shih, A., & Jackson, K. C. (2007). Role of corticosteroids in palliative care. 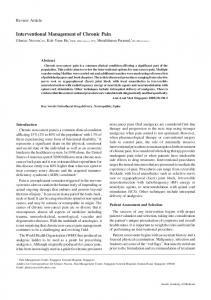 Journal of Pain & Palliative Care Pharmacotherapy, 21, 69–76. Simm, P. J., Allen, R. C., & Zacharin, M. R. (2008). Bisphosphonate treatment in chronic recurrent multifocal osteomyelitis. Jornal de Pediatria, 152, 571–575. Report "Pharmacology of Chronic. 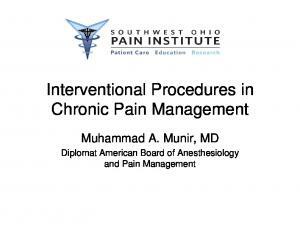 Pain Management"